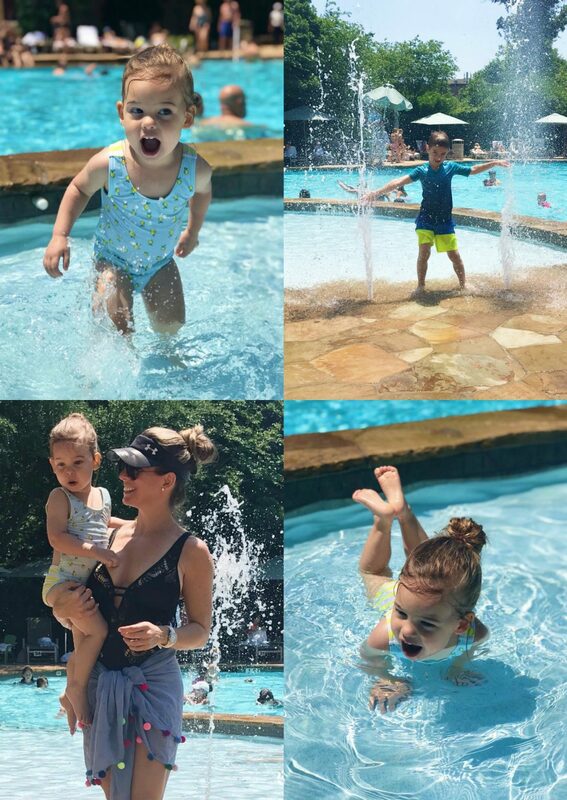 Then, we got to take advantage of our warm weather here by going to the pool for the first time this year! It’s one of my favorite things to do! James is a pretty good swimmer now and can go down the slide by himself, which means I can stay with Jordan in the kid pool while she splashes around. She absolutely loves the water and I think we need to start swimming lessons soon! Today we’re wrapping up the month before we skip into May! May?! That means school is almost out!! How did that happen?! Of course, there are no camps or anything on the agenda because my son loves to be home. I can’t blame him! #homebodies But, I’m sure he’ll want to do some things as the summer gets going. But let me not get ahead of myself! We’re still in Spring! And, I’m happy to announce that I’ve done a little Spring Cleaning on my blog! I started by creating new shop tabs so you can easily find all the different items you ask about in my house! At the Shop tab in the top right corner menu, you’ll find all the different rooms in our house – including our Master Bedroom re-do! I’ve also got a spot for Beauty, my fave Shoes and Accessories and of course my Instagram. I hope this is a good resource for you. Let me know if there are any other shop menus you might want to see. I started the month with different ways to wear your favorite white jeans!! Work . Weekend . Wow | White Jeans shared three different places to take these jeans and three more ways to style them – because those first three outfits were not enough! Gingham has definitely become a thing for Spring, aren’t you loving it too?! 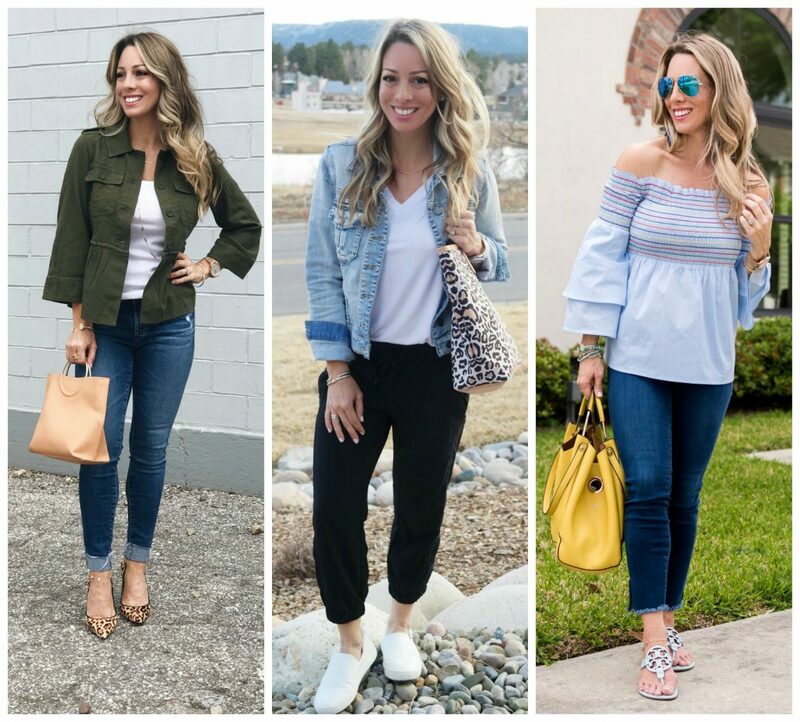 I partnered with JCPenney for an Affordable Spring Finds post that you really appreciated because the prices are so good and the things so cute! This Outfits Lately post was a king-sized one, but it featured some really great and colorful outfits. I was all about the pinks and reds, but can’t quit the neutrals! Now that I’m in my 40s, I know I need to make skin care a top priority. The years do not discriminate, but there are things we can do to help our skin look as good as it can! Of course, you know the big rules: avoid the sun and wear sunscreen, drink a ton of water and don’t smoke- and get a good night’s sleep. A little makeup can do wonders too! The most important rule of all is to WASH YOUR FACE with a quality cleanser! In my Guide to Youthful Skin I walked you through my morning beauty routine. I highly recommend these products and if you don’t know where to start, get the Discovery Kit to try 7 of the best-sellers and get a handy travel bag too! The Discovery Collection is a $150 value, on sale for $69 right now for Mother’s Day!!! I gave that to Ali-Shaun for her birthday this year! As I try and keep up with my morning routine, I’m really focusing on What I Eat in a Day. It’s not nearly as rigorous as my past experience with the fitness competition, but I do like to follow the six food guidelines I learned from the competition. I also shared my 10 Habits to Increase your Daily Productivity. There are many benefits to working from home – one of which is a laid back dress code! Each month I look forward to sharing my monthly loves and these April Loves were no different. So many fun and exciting things for Spring – and look, there’s that Discovery Collection again! Friday the 13th is supposed to be a scary day, but there’s nothing scary about the Dressing Room post from that day! The tops of the moment are all about gingham, ruffles, color, and embroidery. All of those details make for the sweetest tops! The black and white gingham skirt makes a great option for work with the white top I showed you above. I’m also really loving the look of a jumpsuit right now and you seem to be as well!! 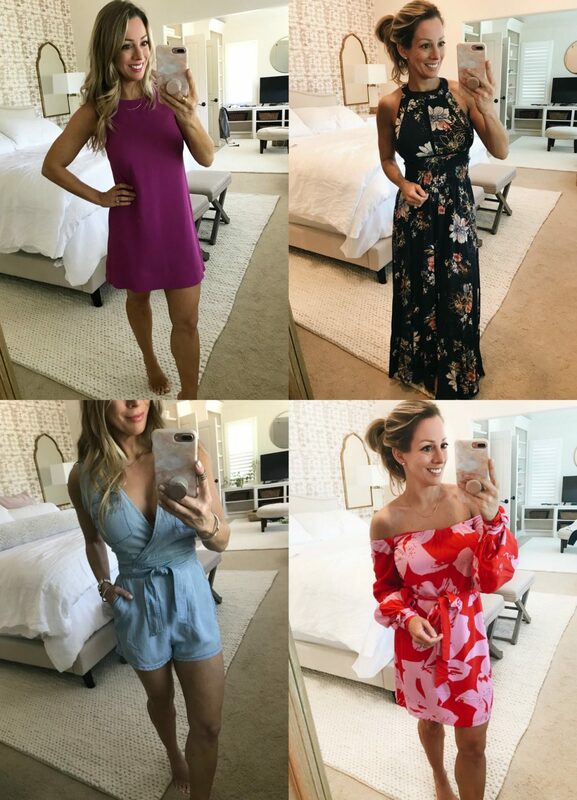 Minus the whole bathroom situation, jumpsuits might be my favorite thing! This was also the post when I introduced these Everyday Wedges. I’m so crazy for them and have literally been wearing them almost everyday! I just ordered the black pair and can’t wait for them to arrive! I’ve already been scheming outfits to wear with them! 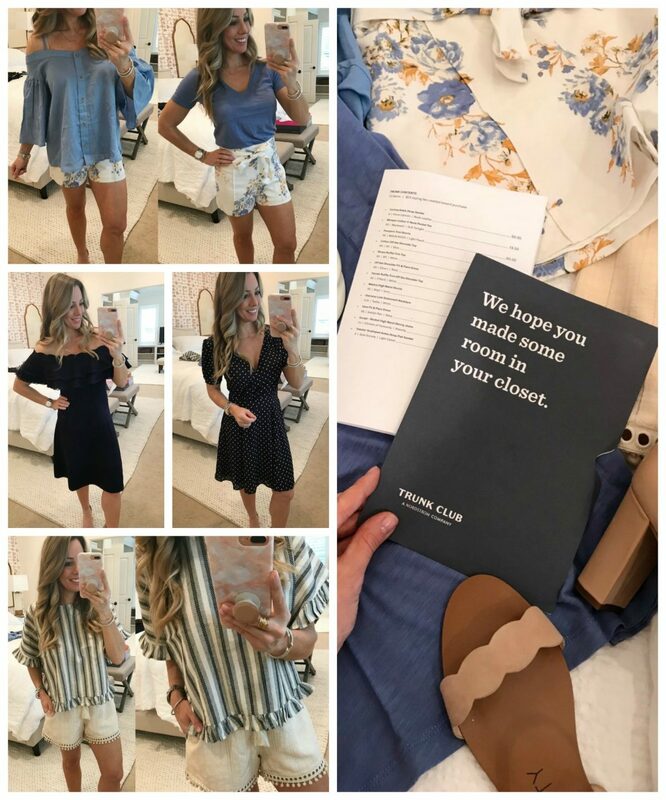 I tried Trunk Club for the first time and shared how you can have Your Own Personal Styling Service through Nordstrom! It’s similar to the Stitch Fix service, if you’re familiar with that, but all the pieces come from Nordstrom and they send more things than you get with Stitch Fix. I actually really liked seeing what they sent because some of it was things I wouldn’t have picked out on my own, but ended up loving! I also posted a giveaway in this post – thanks to everyone who entered and to everyone of you who takes time out of your day to stop by here! The winner has been contacted and will be receiving her Petite Heat Eyeshadow Palette and Urban Decay Lip Glosses soon! Congratulations Michele P! There were some awesome sales that I shared in one big Weekend Steals post! 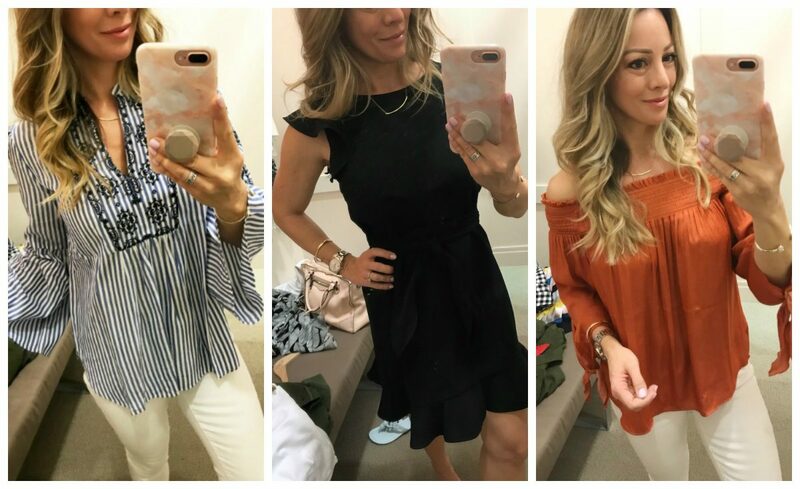 It’s been about a week, but there’s still quite a few good things available at LOFT, Nordstrom, and Kendra Scott! Last week I styled a white blazer for work and on the weekend! A blazer will add polish and sophistication to nearly any outfit. I’m crazy for this well-tailored blazer because it’s great quality and has three-quarter sleeves with a tiny bit of ruching that makes it extra special. You’ll easily be able to dress this blazer up and down and it’s under $80! 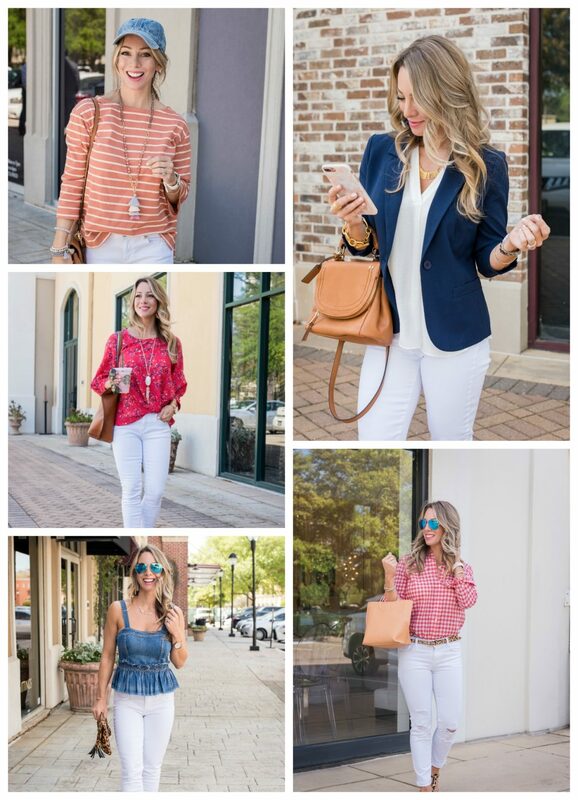 I loved putting together 35 Spring Outfit Ideas for you and sharing lots of pink/fuschia, bright/bold accessories, ruffles, and gingham to be had! The last Friday of the month seemed like the best time to finish up with a This & That post. 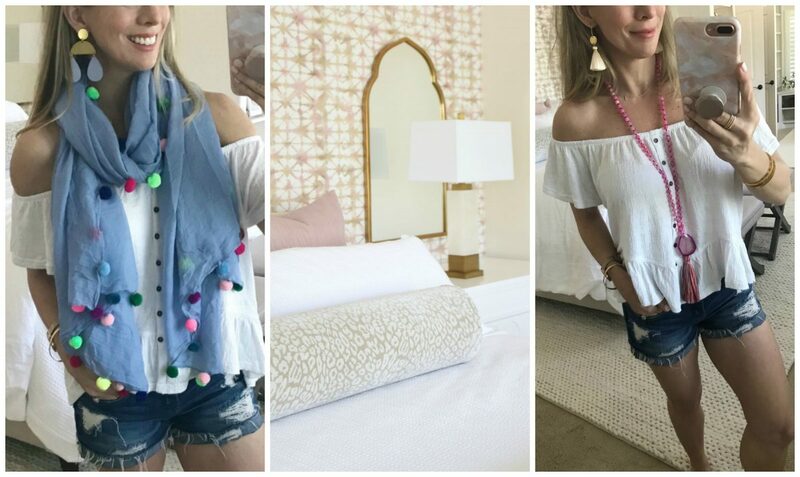 I highlighted the bedroom makeover progress, a super cute pom pom scarf (and 4 ways to wear it as a swimsuit coverup) and a necklace named just for me!! #howcoolisthat?! 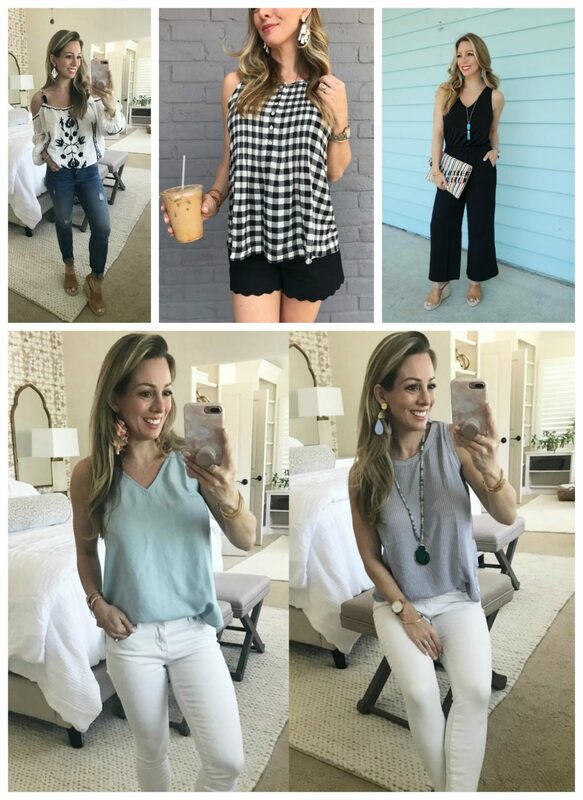 The This and That also had a couple more Spring outfits and try-ons for you!! I ordered the Discovery set from Colleen Rothschild and I LOVE it. My second order should arrive today – thanks for much for the suggestion. I ordered 2 for birthday gifts this month!! So excited to give them!! What a fun month of posts!! I missed your morning skincare routine! Going to check that out! Hi Erin! It’s a ‘pink drink’ – if you ask for that, they’ll know what you mean! I’m sure I shop more than most people, but a lot of the clothes I try on in my dressing room posts go back!